The company just completed a $12-million equity offering despite assuring in December that it had enough funds to put Bisie into production. A recent change in the mining method will drive up costs in 2019 and 2020. Overall, I think that Alphamin is still a compelling investment opportunity but it’s better to wait until Bisie enters commercial production. On April 8, Toronto- and Johannesburg-listed Alphamin Resources (OTCPK:AFMJF) announced it raised $12 million in an equity offering after identifying a working capital shortfall of $9 million due to a change in the mining method at its world-class Bisie tin project in the Democratic Republic of Congo (DRC) and other project delays. With full commissioning and ramp-up scheduled for Q2 2019 and production at planned throughput expected in Q3 2019, the company is diluting shareholders on the final stretch of development. In December 2018, Alphamin had assured investors that it was sufficiently funded till production at Bisie following the draw-down of the final $20 million of its $80 million credit facility. What a difference a few months can make. Alphamin CEO Boris Kamstra recently claimed that mines of this nature and grade strength have not been seen probably in the last century. The quality of the grades meant that Alphamin would be a lowest ten percentile producer of tin in concentrate in the world. While initial mine life is 12.5 years, the exploration potential is amazing and the company believed that the region can produce tin for well over 30 years. At the end of November, Alphamin mentioned in its accounts for Q3 2018 that rock conditions underground had made it review its chosen mining method. This was a big red flag and the company subsequently switched its mining method plans to cut and fill. This requires an update to the mine schedule as well as the life of mine schedule. Alphamin had initially selected the sublevel caving mining method, which resembles top slicing in that the ore body is worked from the top down, and the ore is taken out in horizontal slices. However, a block of ore is left above the slice and when a small portion of the slice has been mined out, this back is allowed to cave. With the cut and fill mining method, mining is carried out in horizontal slices along the ore body, where the bottom slice is mined first. The excavated area is then backfilled and production continues upwards. It’s generally referred to as a small-scale mining method. Each of the two mining methods has its own advantages and disadvantages, but the most important issue for shareholders of Alphamin should be that cut and fill is more expensive. 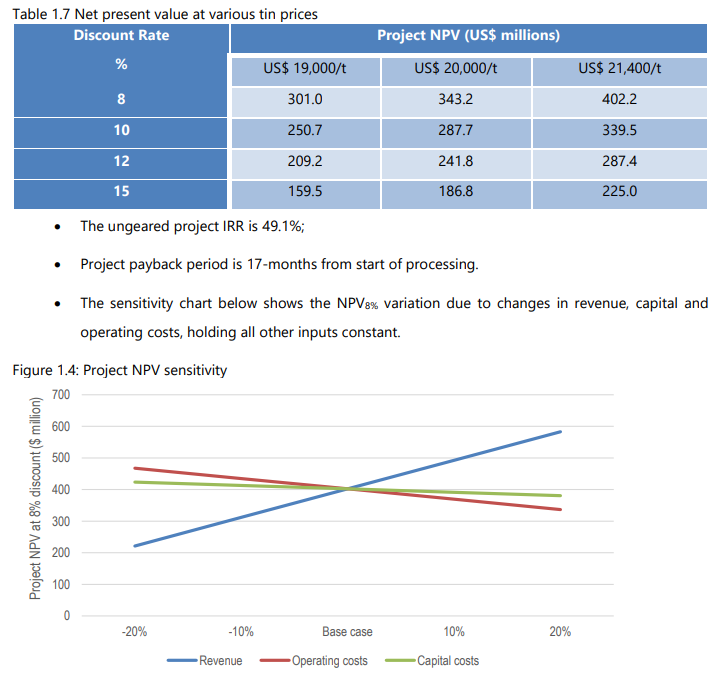 No figures are still available but Alphamin said that initial analysis indicated that the unit costs per ton will be higher in 2019 and 2020 than what had been anticipated in its most recent feasibility study. The update of the life-of-mine schedule is expected during Q2 2019 following which the company plans to announce updated project economics. The change of the mining method to cut and fill resulted in a slower ramp-up of material to the run of mine stockpile. Other contributing factors to the $9-million shortfall in working capital included a delayed response to a request to partially export concentrates by airfreight, which meant that the company had to truck all export material, a delay in VAT refunds and a delay of manufacturing and delivery of certain components to complete plant commissioning. Alphamin owns perhaps the best tin project in the world but its recent troubles highlight the risks associated with putting a mine into production. While presentations of mine developers always look amazing, cost overruns, delays and technical issues are common. I think that the company still presents a compelling investment opportunity as this is a world-class project involving a commodity which will see growing demand thanks to the adoption of electric vehicles. Despite the change of the mining method, the extraordinary grades should guarantee Bisie a place among the lowest-cost producers in the world. Still, I prefer to wait until the mine reaches steady-state production before investing in Alphamin and I think that the company could’ve avoided diluting current shareholders by taking on more debt. If you like this article, consider joining The Gold Commonwealth. There's a two-week free trial and the service will focus on long ideas, takeover targets, turnarounds, exploration stories and under-followed gems in the mining space, particularly gold. Omnis Quis Coruscat Est Or! Additional disclosure: I am not a financial adviser. All articles are my opinion - they are not suggestions to buy or sell any securities. Perform your own due diligence and consult a financial professional before trading.